What have David Bowie, A-HA, Simple Minds, Ultravox, Echo & The Bunnymen, Bronski Beat, Howard Jones, Tina Turner, Simply Red, Chris Rea, Chicago, Roxette, Foreigner, The Cars & The Pretenders got in common? Well, they are all on this wonderful new album titled, ‘80’s SYMPHONIC’ released on 9th of November 2018. It is full of some of the most amazing songs, but, with the addition of a stunning orchestra. I suppose I have cause to be slightly biased, as I was involved in this project as photographer. However, Andy Wright, one of the world’s best and most in demand record producers, who I am proud to say a great friend of mine, has produced this masterpiece. Andy was Warner Brothers first choice for this for many reasons. A couple of them are;- He is exceptionally good at his job. He has worked as a producer with many of these artists. In fact, I understand that Andy has produced around 10 albums for Simply Red alone. Let alone his work with the other bands mentioned above. The orchestrations on this album were created by the brilliant Sam Swallow, who I have worked with quite a lot as well. He is such a clever fellow and he has done a beautiful job here on ‘80’s Symphonic’. So, we have all of the original tracks with the addition of magical dust from Andy Wright & Sam Swallow. A-HA - Take On Me, Simple Minds - Alive & Kicking, Ultravox - Vienna, Tina Turner - What’s Love Got to Do with It, The Cars - Drive, Simply Red - Holding Back The Years. David Bowie - Lets Dance. By the way, that track by Bowie was brilliantly orchestrated / produced by Nile Rodgers. Obviously Nile was the first choice for this track as he had worked with David Bowie on quite a few things as well as being a legend and lovely guy as well. David Bowie’s estate insisted that Nile worked on this track as Nile knew how David Bowie would have wanted it to sound. There are more on tracks on this album, but you get the idea I am sure. These are big bands with big songs. All of which sound stunning. Stuart Crouch has also done a fantastic design job on the album cover and booklet. As did Gavin Goldberg who was engineered and mixed the album assisted by Lewis Chapman. All great guys brilliant at their jobs and friends of mine as well. Here are some photos during the making of the album at Abbey Road. Some photos were taken in Studio 2 of Beatles fame and some in Studio 1. In fact that’s silly of me because everyone seems to have used those studios. Sam Swallow & Andy Wright in Studio 2, Abbey Road Studios. 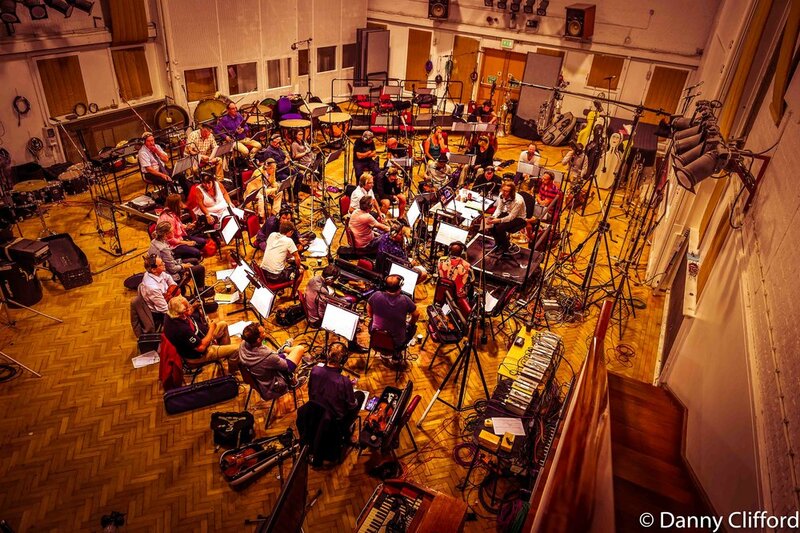 Sam conducting in Studio 2, Abbey Road Studios. Sam in Studio 2, Abbey Road Studios. Gavin Goldberg running back up to the control room in Studio 2. The same route that many a famous performer has taken. Including the FAB Four (The Beatles)..
Andy Wright producing up in the control room in Studio 2. Looking down at the Orchestra. To his right is the charming, Lee Alexander. Nile Rodgers in Studio 1 during the Lets Dance, David Bowie track. Also, some of my photos from Tuesday evening at Abby Road in Studio 3, where Andy, Sam & Nile did a bit of a press Q&A. The Question & Anwer session held in Studio 3 at Abbey Road. Andy Wright & Sam Swallow. 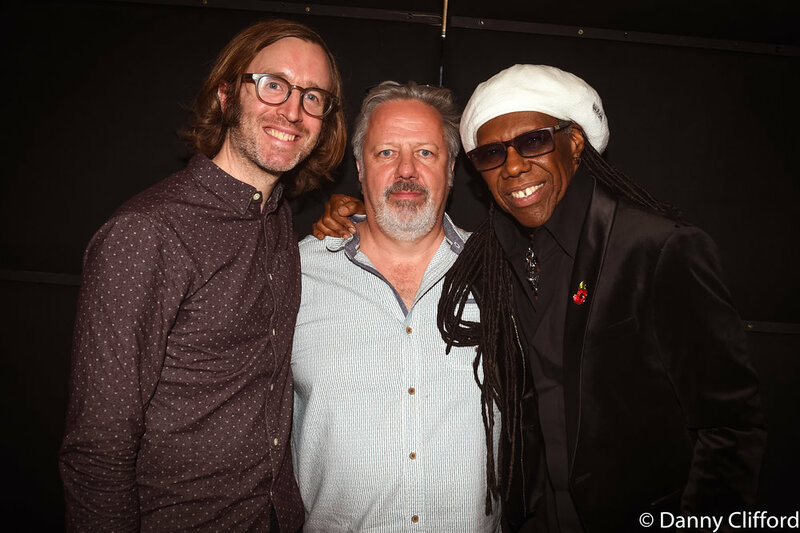 Sam Swallow, Andy Wright & Nile Rodgers. 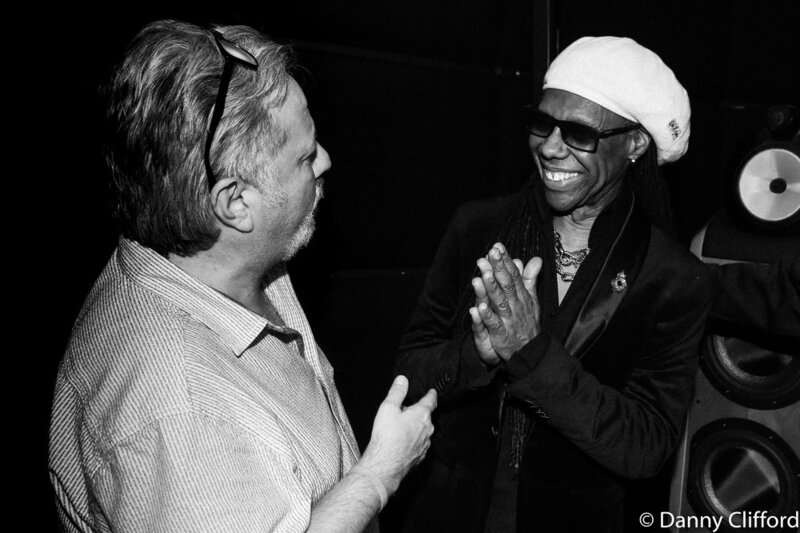 Andy Wright & Nile Rodgers. Warner Brothers told me that they will be taking this out on the road next year around the UK. Oh and A-HA are on TV in the UK tomorrow evening (9th of Nov) promoting this, which is nice! The album is released on the 9th of November. With Xmas around the corner, I think it will be a great success. Saying that, I am waiting for critics to have a pop at them for this album. Only because that seems the fashion these days! After all, only a week or so ago the critics were pretty much full of bad revues for Bohemian Rhapsody. Oh, how wrong they were as its now probably the most successful film in the world right now and like Bohemian Rhapsody, this album ‘80’s Symphonic’ is brilliant.